A seventh overall pick in the 2007 Draft and one of the key components of the deal that sent CC Sabathia to Milwaukee in 2008, LaPorta has not yet produced as well as the Indians had hoped at the Major League level -- he's hit .238/.304/.397 in 269 games over three big league seasons. After being demoted to Triple-A to start the 2012 campaign, LaPorta has responded with a fine month at the plate. He collected at least one hit in 18 of his first 19 games and is batting .368. On Tuesday he went 4-for-5 with a homer, two doubles and three RBIs against Toledo, and in his next three games LaPorta was 6-for-8 with four walks and five more RBIs. The 23-year-old Wheeler closed out his first month in Triple-A with a monstrous week that saw him hit, score and drive in at least one run in each of his five games. The outburst raised Wheeler's slugging percentage 98 points and helped the Aces sweep a four-game set at first-place Salt Lake. The 23-year-old corner infielder began the season as the Diamondbacks' 18th-ranked prospect but is sure to climb the list with production like this week's. Mujica began the season with Triple-A Scranton/Wilkes-Barre but got only three plate appearances in three games before being reassigned to Trenton. Apparently, all he needed was playing time. The infielder is 10-for-18 with six runs scored in six Eastern League games and has reached base at a .600 clip while manning third base, second base and shortstop for the Thunder. Over the weekend, the 27-year-old Mujica went 5-for-7 with a pair of walks in two games at New Hampshire. Krauss got off to a slow start in his second season with Mobile and was batting under .200 as late as April 21. After stringing together a nine-game hitting streak -- and scoring at least once in seven of those games -- the Ohio product sports a robust .419 on-base percentage and ranks second on the BayBears with 18 RBIs. The 24-year-old Krauss, who was a second-round pick in 2009, homered on Tuesday, doubled three times on Wednesday, added triples on Friday and Saturday and doubles on both Friday and Sunday. After a relatively low-key 2011 season, MLB.com's No. 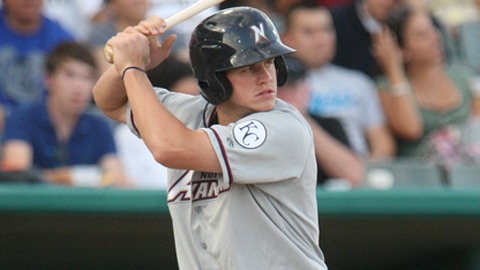 19 prospect has been red-hot throughout April for the Naturals. The 21-year-old began the campaign with a 13-game hitting streak, went 0-for-4 in Game 14, and is currently riding a six-game streak during which he's gone 11-for-22. Myers homered for the second straight game and fell a triple shy of the cycle against Springfield on Thursday. With a .354/.414/.684 line thus far, the slugger may not be long for the Texas League. Having hit .301 with 20 homers and completing the first cycle in Dayton Dragons history last season, it comes as no surprise that Lutz is thriving in the Cal League. Beginning last Sunday, Lutz delivered at least one extra-base hit -- including four home runs -- in his next six games while driving in 10 runs. The 23-year-old ranks second on the circuit in homers and RBIs and has helped the Blaze put together the best record in the league. Tice began the week with a season line of .234/.357/.404 and ended it four games later at .328/.425/.656. Three homers, three doubles, three singles and two walks in four games provide quite a boost. With the offensive outburst against visiting Lynchburg, the 25-year-old slugger now leads the Mudcats with four homers, eight doubles and 18 RBIs in 18 games. Marisnick, MLB.com's No. 58 prospect, began the week mired in an 0-for-13 slump. His extra work with Dunedin hitting coach Ralph Dickenson began to pay off on Tuesday, as the 21-year-old slugger clubbed his first longball of the year at Tampa. Marisnick followed with four straight multi-hit games, adding two more homers and a double while plating six runs. The 2009 third-round pick's third blast in five days helped the Jays top the Yankees, 6-1, on Saturday and open up a 5 1/2-game lead over Lakeland in the FSL North. Robinson has emerged as one of the Midwest League's top run-producers, with two homers and nine RBIs this week pushing him into the league lead in both categories. The Fresno State product went 4-for-5 with a longball, a double and three RBIs against Great Lakes on Tuesday. Though he picked up only four hits in the week's remaining five games, Robinson still drove in six runs. The 22-year-old is batting .188 with runners in scoring position -- 98 points below his overall average. When that number rises, Robinson will be even more dangerous. Rivera has reached base in each of his 23 games this season and has hits in 21 of them. The Bronx-born infielder kicked off his week with his second four-hit game of the season -- one of the hits was his first homer -- at West Virginia on Tuesday, then added two more longballs and seven RBIs in the next four games. Rivera ranks second in the Sally League in on-base percentage (.477), third in batting (.396) and sixth in slugging (.582). This week's power surge lifted his slugging percentage 90 points.